Envirolite 6 in. 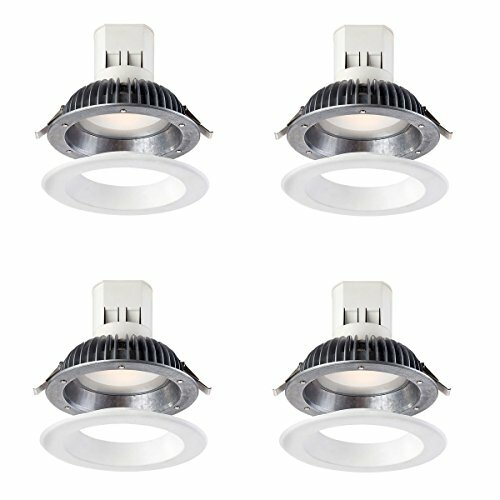 Easy up LED lights are the most innovative LED recessed ceiling products on the market for residential, commercial, new construction or remodel applications. They are an integrated LED recessed trim with a j-box attached that allows installation without a pre-installed recessed housing can. Simply pull down the wiring through the hole in the ceiling and connect it directly to the fixture. The spring loaded clips clamp the fixture to the finished ceiling. These recessed ceiling lights use 70% less electricity to produce the same amount of light as incandescent light and, you don’t have to replace light bulbs ever. These LED lights are wet location rated, can be used in ceilings with or without insulation, and they are compatible with most LED rated dimmers. Each ceiling light comes with an air tight gasket to seal off the area around the trim to prevent losses of air conditioning and heat, saving you even more. These lights are energy star listed and backed by a 5 year warranty. Watch the installation videos below to see how easy up is changing the way that electricians and electrical contractors are installing recessed downlight.